To learn more about what’s happening in the world and breaking news stories, it makes sense to so what other Googlers are searching for. Hot searches has been refreshed to make a more visually appealing list of searches, grouped rising search terms and collective information about those searches. Hot Searches will contain images and links to the related news stories to give you an idea of why these topics are particularly hot at present. A new filtering system also helps to ensure only the hottest news stories of the day are returned (unlike the old version with 20 daily results). Google’s Hot Searches now also provides an indication of the volume of searches that have been made for each topic displayed (within the 24 hour period of its trending). 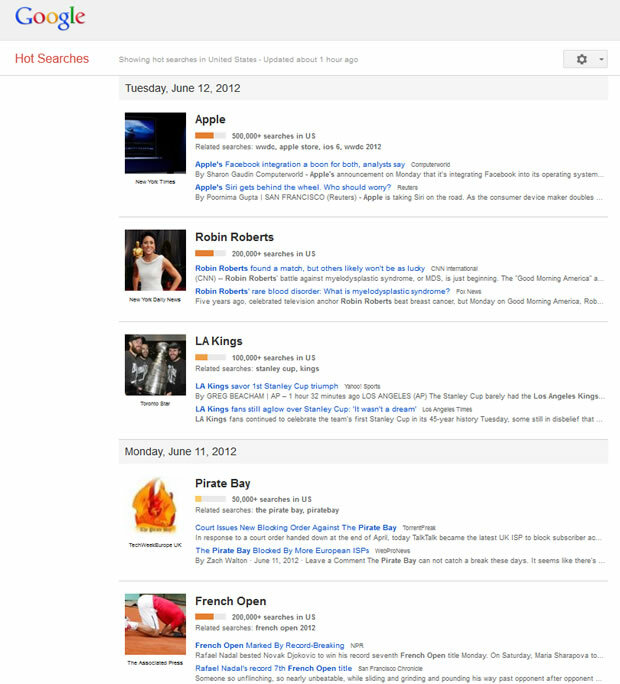 Keep up-to-date with the latest hot searches visit Hot Searches list from Google Trends. Original Article Posted by Nimrod Tamir, Google Trends Team.